Each and every charter guest, 18 years of age or older, that wants to put a fishing line in BVI waters must have a BVI fishing license in order to do so. 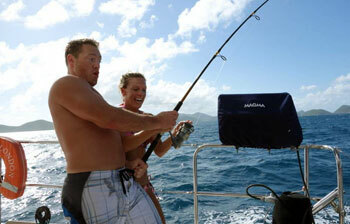 Charter guests under the age of 18 may fish without a BVI fishing license. Charter guests that will not be putting a fishing line in BVI waters do not need to obtain a BVI fishing license, even if aboard a yacht that will be engaging in BVI fishing activities. All vessels must have a BVI fishing vessel registration number in order to engage in any fishing activities in the BVI. If your yacht has the required fishing vessel registration number we will supply you with all the details approximately 6 weeks from the start of your charter. If they do not have the required registration number, they will not be legal for any fishing in the BVI. There is no guarantee that fishing will be an option on any charter yacht. It is recommended that you apply for your fishing license 1 month prior to your charter start date, but no later than 1 week prior to your charter start date. Our clients will receive a fishing email approximately 6 weeks out with step-by-step instructions about how to apply in advance and then obtain your physical license while on charter. The waters around the US and British Virgin Islands are shallow and typically less than 100 feet deep. These waters are where you will spend a majority of your time during your trip. The fish that typically inhabit these waters include barracuda, snapper, grunts and bottom fish. These reef fish can carry a poisonous toxin called Ciguatera and eating these fish is strongly discouraged and therefore not allowed aboard our crewed yachts. Therefore, any reef fish that you may happen to catch on charter will be released and charter guests should realize in advance that fishing activities on these charters are simply for fun. Also, fishing in the Marine Parks is illegal, and fishing in the various anchorages is not allowed due to the fact that the same fish are being caught over and over again and are being injured or killed. Fishing while on charter takes place while you are trolling underway between the islands. Spear fishing is illegal in the BVI. The use of scuba equipment to capture or remove any marine animal or coral is prohibited. Fishing within the boundaries of any marine park is forbidden. Penalties for non compliance of any fishing regulations can include severe fines, plus confiscation of fishing equipment and the charter yacht.